Ragland lead Alabama in an impressive defensive effort against Arkansas. The Tide’s latest SEC win, and eighth in a row over Arkansas, was won by its defense. The Hogs leading rusher Alex Collins was limited to a whopping 26 of Arkansas’ 44 yards gained on the ground. The defense also forced two turnovers, held Arkansas on 11 of its 16 third downs and on the only fourth down attempt of the game. Unfortunately, only one player can be honored as the league’s most outstanding defensive player for the week. •	Ragland led an Alabama defense that held Arkansas to just 220 yards and 14 points in a 27-14 win. •	He led the team for the fifth time this season with eight tackles, including seven solo stops. 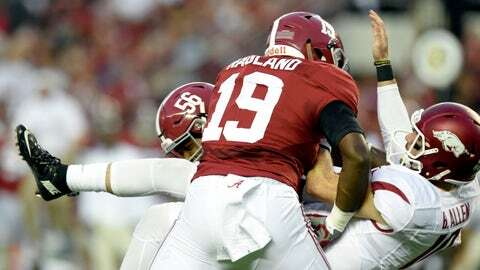 •	Ragland was all over the field with one sack, a forced fumble, pass breakup and two quarterback hurries. •	He helped Alabama force seven 3-and-outs in 14 Razorback possessions and limit the Hogs to just 77 first half points. •	Ragland led a defensive charge that limited Arkansas' vaunted rushing attack to just 44 yards on 25 carries for a 1.8 yards per carry average. •	Led the Crimson Tide defense in production points.